Biodiesel enthusiasts are converging in San Diego this week for shows and announcements at the industry’s largest gathering of producers, distributors and fans. 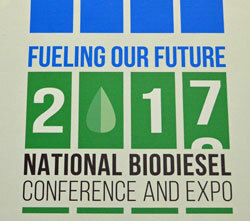 “The General Session is one event attendees won’t want to miss,” said Donnell Rehagen, CEO of the National Biodiesel Board, which produces the annual conference. “Not only will they get presentations on what’s been accomplished and what’s expected ahead, we are looking forward to a very special announcement from General Motors that will be exciting news for biodiesel fans everywhere. Attendees will also enjoy the Biodiesel Vehicle Showcase that kicks off Tuesday in the Expo Hall. There they will find the latest biodiesel-capable vehicles, technologies and special announcements on what to expect in the future. Watch for the latest from the National Biodiesel Conference here.